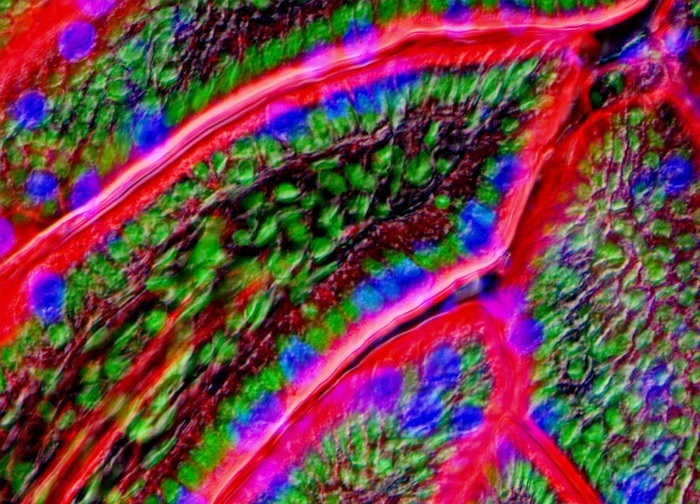 The sample of mouse intestine tissue presented above was triple labeled before imaging. Alexa Fluor 568 (red emission) conjugated to phalloidin was utilized to target F-actin and Alexa Fluor 350 (blue emission) conjugated to wheat germ agglutinin was used to target sialic acid and N-acetylglucosaminyl residues. The popular green fluorescent nuclear and chromosome counterstain SYTOX Green was also employed. Images were recorded in grayscale with a 12-bit digital camera coupled to either a Nikon E-600 or Eclipse 80i microscope equipped with bandpass emission fluorescence filter optical blocks. During the processing stage, individual image channels were pseudocolored with RGB values corresponding to each of the fluorophore emission spectral profiles.